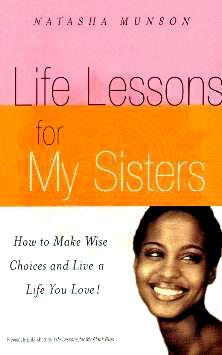 Life Lessons for My Sisters - How to Make Wise Choices and Live a Life You Love! Life doesn't come with a handbook, neither does marriage or children. So, we need all the help we can get, and while most young women get advice from their parents, or follow by example, too often too many girls don't get any at all. Not all advice is good advice - many times it's just old news passed down and teenagers are notorious for 'knowing it all' and thus, don't listen. They do not know it all and most will learn through trial and error, but if a few get the message, good job. Author and motivational speaker Natasha Munson, kindly wrote a book to help us make the right choices in life - this one life we are given. She talks about loving yourself before you can love another; knowing when to end a friendship; learn from your experiences, and two I whole-heartedly agree with, "Let Your Good Deed Speak for Itself" and "Respect is a Simple Thing". A quote from her first poem (there are many) in the book, "The Only Way to Live" says it all, in my opinion: "let your spirit be your guide to a life filled with love, find what you love to do and do it well". Something I also agree with is "No matter what happens in your life, keep your realistic dream and wish list and work on it". What I don't agree with however, is just prior to this she says "Don't think limited" when referring to having dreams for yourself. I agree on the "realistic" aspect - by all means, have dreams, but to prevent sadness, disappintment and feelings of failure when they are not attained, because everyone has limits, one must know their own personal limits. I say do aim for the stars but be satisfied with catching a falling star on your journey, especially if your journey doesn't take you all the way to the star you want. Be realistic but do dream. Personally, I always say if nothing else, we're all equipped with knowing right from wrong, and that's all we need (especially if you're trying to help a surly teenager) in life, at least to start off with and to pass on to others. The book is made up of lots of little easy-to-read chapters which makes for easy stop/starting reading. . Another thing I don't believe in, which is tossed around freely, is that "you can have whatever you want in this life" - this is just setting yourself up for disappointment - be realistic and know that not everyone has everything they want in life - just look around you. Not everyone can become an astronaut even if this is their dream - there are lots of things in your life that will preclude this dream from being realised. I don't understand that Chapter One is entitled "Don't Listen to the Opinions of Others" but in the next chapter she says "... ask some friends and family members what they think your strengths and weaknesses are", and "... think about their opnion". I think you should listen to all and you be the judge of who makes sense and who doesn't, providing you are actually listening carefully to what is said. Opinions do help. Great advice under "Education" is "the goal is to find something you love to do, not something you have to do". Big difference. Natasha Munson can be reached at her website for more information. Conclusion - Great inspiration for all young women, and older women (sometimes it takes longer to "get it"). Do read it and absorb her advice and share it with others who may need it. I make all these comments as I am writing a similar book and came up against many of the same things.